← New at Burners.Me: Cartoons! …the idea that Bernal Heights consists of several distinct microhoods actually makes a lot of sense. 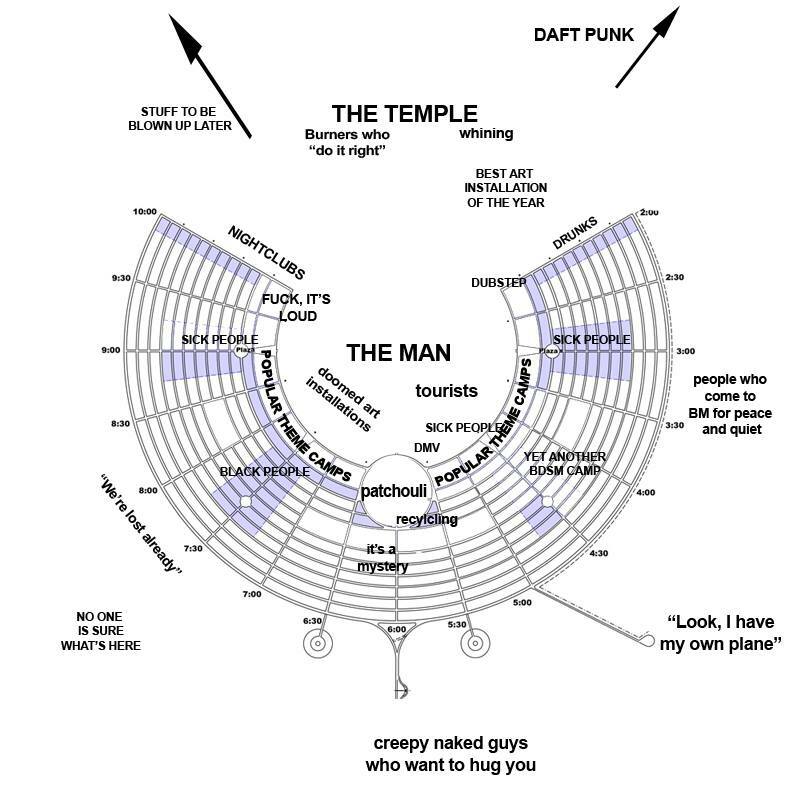 After all, Bernal is a neighborhood defined by its topography — Remember, our last name is “Heights!” — so there’s an intuitive logic to the notion that different parts of the hill have very different subcultures and identities. Yet we are far more than our cost per-square-foot; we are a federation of nooks and crannies shaped by timeless geological features, historical quirks, and neighborly idiosyncrasies. Precitaville – With the Mission as a front yard, Precita Park as the living room, and Bernal Hill as a backyard playground, Precitaville is perhaps the most cosmopolitan part of Bernal Heights. Perhaps. Santana Rancho – Carlos Santana used to live here; Janis Joplin used to party here. The steep slopes and meandering streets of Bernal’s northeast corner have made it a secret haven for generations of local artists, musicians, and eccentrics. The Sutrito Canine Republic – Located atop Bernal Hill in a public park, The Sutrito Canine Republic is patrolled by packs of very happy dogs who frolic off-leash and worship the microwave antenna array mounted atop Sutrito Tower. The Hill People of Powhattan – With their homes clustered around Powhattan Avenue in the high-altitude reaches of Bernal Hill’s southeastern quarter, the Hill People of Powhattan are easy to recognize: Just look for their massive, hill-toned calves and slightly elevated demeanor. Alemanistan – Dry, rocky, and sun-baked, Alemanistan retains a wild, untamed feel. Perched in the shadow of the Spaghetti Bowl, at the crossroads of two major highways, this is Bernal’s frontier borderland. Cortlandia – The heart of Bernal’s historic commercial district has now become the ideal setting for a contemporary situation comedy about bourgoise-bohemian urban culture in the early years of the 21st century. Which is funny, except that it’s also rather lovely, and we are very lucky to have it. The residents of Cortlandia are justifiably quite proud of this. Baja Bernal – Perhched just south and slightly below Cortland Avenue, Baja Bernal is scrappy place of haphazard hills, multigenerational residents, and intense, superhyperlocal pride. Portola Norte – As if unfazed by the barrier created by an interstate freeway, this area of Bernal Heights feels contiguous with the pre-gentrified ethos that prevails on the other side of I-280. St. Mary’s Park – Developed during the 1920s on the site of the former St Mary’s College campus, this self-contained, bell-shaped enclave feels like a little slice of the Sunset District, right in our own corner of Bernal Heights. Lost Tribe of College Hill – Separated from the Bernal heartland by Mission Street, yet isolated from Glen Park by freeways, College Hill’s de facto independence is symbolized by a recent redistricting that saw the area transferred to Supervisor Scott Wiener’s District 8. Holly Park – This ancient district of Bernal Heights is home to one of San Francisco’s oldest parks and a covered reservoir that has long been the setting for much local scandal and drama. Foggy Vista – Rising above Mission Street on Bernal’s west slope, the groovy people who live here enjoy a commanding view of Nature’s own lava lamp: the massive banks of fog that cascade over Twin Peaks. Residents eagerly await construction of the Esmeralda Funicular to facilitate transit to and from the bustling Mission Street corridor. La Lengua Autonomous Zone – This territory has been an integral part of the Dominion of Bernalwood since the 19th century, but today the uppity people of La Lengua enjoy limited autonomy under the terms of the 2010 Proclamation to the Vassals of La Lengua. The Principality of Chicken John – Though located within the territorial boundaries of Bernal Heights, Chicken John’s warehouse residential complex and bus depot on Cesar Chavez functions as a world unto itself. Operating under its own sovereign codes, aesthetics, and social norms, and with it’s own 4.5 star rating on Yelp, The Principality of Chicken John is, in effect, Bernal’s version of the Vatican. Serpentinia – Named after a long-gone street that used to mirror Precita on the northern side of Army/Cesar Chavez, Serpentinia is today defined by the major thoroughfare that now slices through its center. After decades of indifference and neglect, recent infrastructure upgrades on Chavez may bring new cultural vitality to this region. 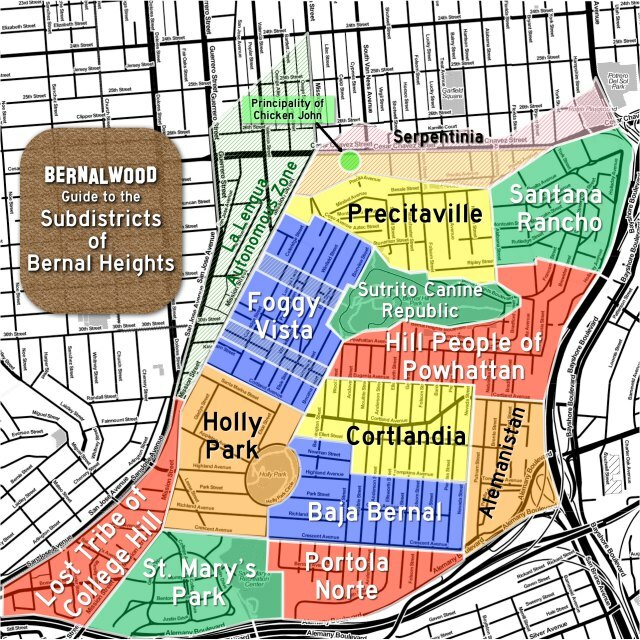 REVISION NOTE: March 19: Based on comments provided by Bernal neighbors, the former “Outer Cortlandia” has been renamed “Baja Bernal,” to reflect existing microhood parlance. The map has also been updated to include this change.